the insertion of a tube, as into the larynx; see also cannulation and catheterization. The purpose of intubation varies with the location and type of tube inserted; generally it is done to allow drainage, to maintain an open airway, or to administer anesthetics or oxygen. Intubation into the stomach or intestine is done to remove gastric or intestinal contents for the relief or prevention of distention, or to obtain a specimen for analysis. Another example of intubation is when a tube is inserted into the common bile duct to allow for drainage of bile from ducts draining the liver, done after surgery on the gallbladder or the common bile duct. Endotracheal intubation can be achieved by insertion of an endotracheal tube, sometimes containing a stylet, via the mouth or nose with the aid of a laryngoscope. It is done for the purpose of assuring patency of the upper airway. tracheostomy is a form of endotracheal intubation. gastrointestinal intubation in the nursing interventions classification, a nursing intervention defined as insertion of a tube into the gastrointestinal tract. Insertion of a tubular device into a canal, hollow organ, or cavity; specifically, passage of an orotracheal or nasotracheal tube for anesthesia or for control of pulmonary ventilation. /in·tu·ba·tion/ (in″too-ba´shun) the insertion of a tube into a body canal or hollow organ, as into the trachea. endotracheal intubation insertion of a tube into the trachea for purposes of anesthesia, airway maintenance, aspiration of secretions, lung ventilation, or prevention of entrance of foreign material into the airway; the tube goes through the nose (nasotracheal i.) or mouth (orotracheal i.) . nasal intubation insertion of a tube into the respiratory or gastrointestinal tract through the nose. oral intubation insertion of a tube into the respiratory or gastrointestinal tract through the mouth. passage of a tube into a body aperture, specifically the insertion of a breathing tube through the mouth or nose into the trachea to ensure a patent airway for the delivery of anesthetic gases and oxygen or both. Blind intubation is the insertion of a breathing tube without the use of a laryngoscope. Kinds of intubation include endotracheal intubation and nasotracheal intubation. The placement of a tube for respiratory support or gastric feeding. See Gastric intubation. Cf Extubation. Intubation of other structures, such as the organs of the upper gastrointestinal tract, may permit enteral nutrition, the dilation of strictures, or the visualization of internal anatomy. The insertion of an endotracheal tube through the nose or mouth into the trachea to maintain the airway, to administer an anesthetic gas or oxygen, or to aspirate secretions. Endotracheal intubation can be hazardous to patients with injuries to, or instability of, the cervical vertebra. In trauma patients suspected of cervical fracture, or in patients (such as those with advanced rheumatoid arthritis) who may have an unstable cervical spine, it is safer to use nasotracheal, rather than orotracheal intubation to control the airway. The improper placement of an endotracheal tube, intended to provide a conduit for air to and from the lungs, into the esophagus. It is a common and potentially life-threatening occurrence during anesthesia and critical illnesses. Health care practitioners have several means at their disposal to try to recognize esophageal intubation. These include direct observation of the endotracheal tube, as it passes through the vocal cords, or capnography. Failure to recognize esophageal intubation can result in inadequate oxygenation of the patient. The insertion of a Levine or other gastrointestinal tube through the nose into the stomach. The insertion of an endotracheal tube through the nose and into the trachea. Unlike orotracheal intubation, the tube is passed “blindly” without using a laryngoscope to visualize the glottic opening. Because this technique may be used without hyperextension of the neck, it is used in patients suspected of having cervical spinal trauma or known to have oral lesions. Endotracheal tubes inserted nasally need to be of smaller diameter than those inserted orally. Endotracheal tubes frequently irritate the nasopharynx, and can cause both bleeding (on insertion), and sinusitis. 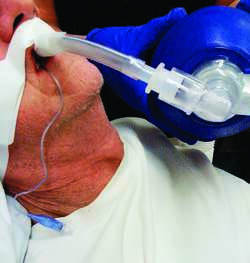 An airway control technique that uses powerful sedatives and paralytic drugs to quickly gain control of the airway, e.g., in life-threatening emergencies. Passage of a tube into the stomach to obtain gastric contents for examination, for prophylaxis and treatment of ileus, to remove ingested poisons, or for feeding. The passage of any tube, such as a CATHETER or windpipe (tracheal) AIRWAY into any organ or tubular structure in the body. Intubation may be done to keep a passageway, such as the LARYNX, open, to withdraw a specimen for analysis, or to administer a drug. The insertion of a tube into the patient's airway to protect the airway from collapsing. Intubation is sometimes done as an emergency procedure for patients with epiglottitis. n the insertion of a cannula or a tube into a hollow organ, such as intestines or trachea, to maintain an opening or passageway. Insertion of a tubular device into a canal, hollow organ, or cavity. n the insertion of a tube; especially the introduction of a tube into the larynx through the glottis for the introduction of an anesthetic gas or oxygen. the insertion of a tube, as into the larynx. The purpose of intubation varies with the location and type of tube inserted; generally the procedure is done to allow for drainage, to maintain an open airway, or for the administration of anesthetics or oxygen. Intubation into the stomach or intestine is done to remove gastric or intestinal contents for the relief or prevention of distention, or to obtain a specimen for analysis, or to introduce drugs, medication, food or nutrients. A rubber or plastic nasogastric tube is introduced through the mouth or nose and into the stomach. For each enrolled patient, atropine was administered intravenously to keep the airway dry, and ephedrine was used to prepare the patient's nostrils in case there was a need for a nasal intubation. Other variables recorded were post intubation duration of stay with ET tube in situ and outcome of patients recorded as mortality in emergency, extubation in emergency, admission to the hospital/ICU and referrals for admission. We considered data missing for intubations performed during the study period if entered more than 6 weeks after the intubation attempt. 17 In this study, we compared the effectiveness of local application of betamethasone gel and lidocaine gel on endotracheal tube during intubation in preventing post-operative sore throat (POST). In hypoglossal nerve palsy related to surgery or anesthesia, the possible causes-including intubation, the surgical positions, and mask ventilation during recovery-must be considered. Mallampati measurement was made with recommendations for intubation in canine, with a patient in sternal lateral ulna, open mouth, exposure of the tongue forward. The duration of intubation was recorded from the time the laryngoscope was taken into the hand until the end tidal carbon dioxide (etC[O. The pressor response is transient occurring 30 seconds of intubation and lasting for less than 5-10 minutes as by Abou-Madi et al11. 001) decrease in heart rate in Group B (esmolol group) as compared with Group A (control group) after 1 and 2 min of intubation. This study was designed to compare the intubation time, number of attempts for intubation and complications of BNTI by using normal ETTs against those softened by warming them with water at 50C. A non-systematic literature review in English and Spanish in the databases PubMed/Medline, SciElo, and Lilacs with the following MeSH and DeCS terms: Videotape Recording; Laryngoscopy; Airway Management; Intubation, Intratracheal; Obesity; Anesthesia. Moreover, due to the prevalence of maxillary protrusion, immature roots, and ectopic eruptions, children are susceptible to dental injuries during oral endotracheal intubation (Windsor, J.